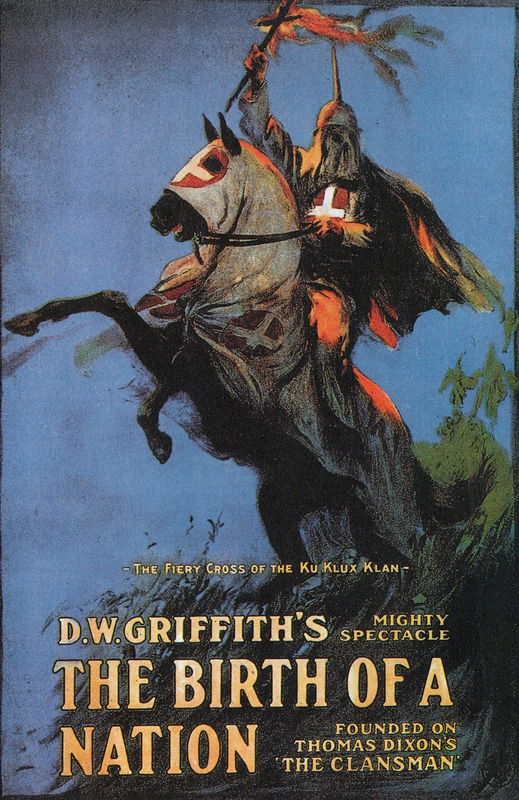 D. W. Griffith’s racist epic The Birth of a Nation (US: Epoch, 1915) caused a sensation when it finally reached Ireland in the autumn of 1916, more for its epic ambitions than for its racism. It played exclusively at just three venues: first, at Belfast’s Grand Opera House, for the three week from 7 to 26 August; next, at Cork’s Opera House for the week of 28 August-2 September; and finally, at Dublin’s Gaiety Theatre for a two-week run from 18 to 30 September. Clever marketing to middle-class tastes, a mastery of filmic spectacle and even its title in a country consumed by a struggle for or against the birth of a more-or-less autonomous nation propelled it into the Irish consciousness like few previous films. “‘Ireland will never be fit to take its place among nationalities, big or small, until it is recast and remade. It is in the melting-pot now…. What picture of the process of remoulding will the historian of the future give his generation? 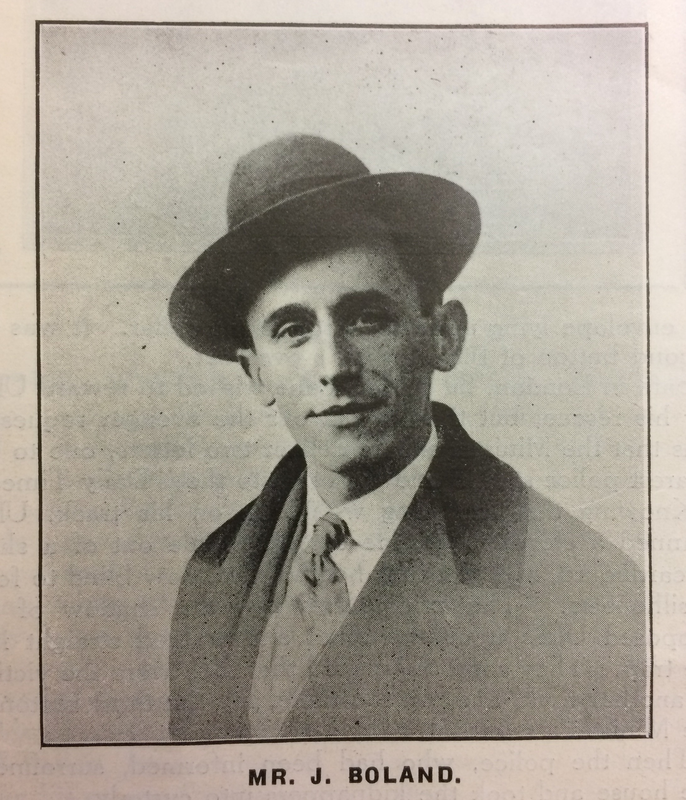 ” This question from US senator Patrick J. Maguire appeared as “To-Day’s Thought” at the top of the Man About Town’s “Seen and Heard” column in the Evening Herald on 26 September 1916. 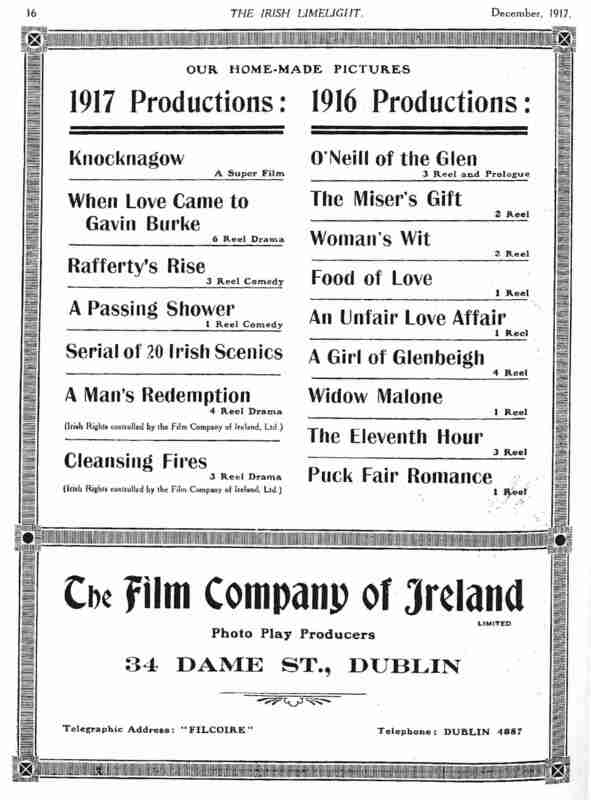 In the column’s “Afterthought,” the Man About Town answered: “Why a moving picture, of course – another ‘Birth of a Nation.’” As writers in the Bioscope and Dublin Evening Mail had earlier in the year, the Man About Town thought that the historiography of the near future would be written not on the page but on the screen, with the light of the film camera and projector. 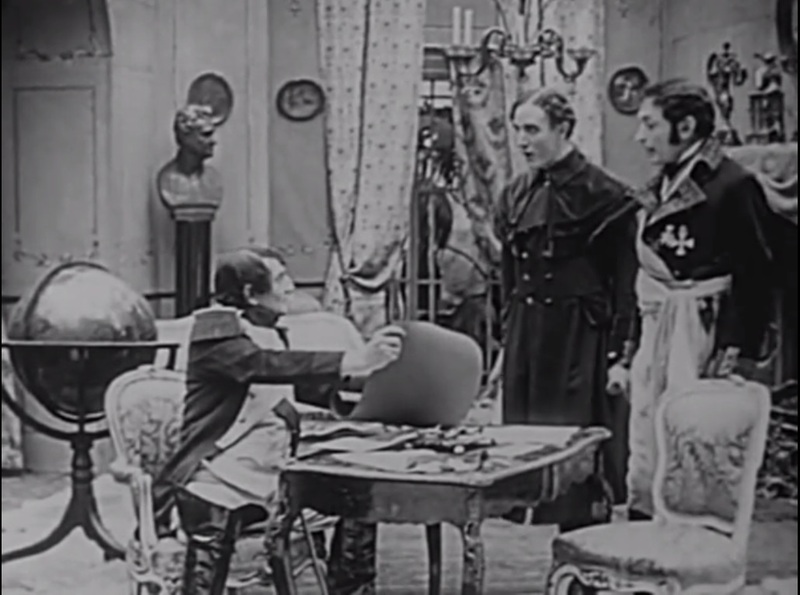 Unlike these previous writers who had discussed British propaganda films, the Man About Town was referring to the fictional Birth of a Nation, which was then starting the second of its two-week run at the Gaiety. 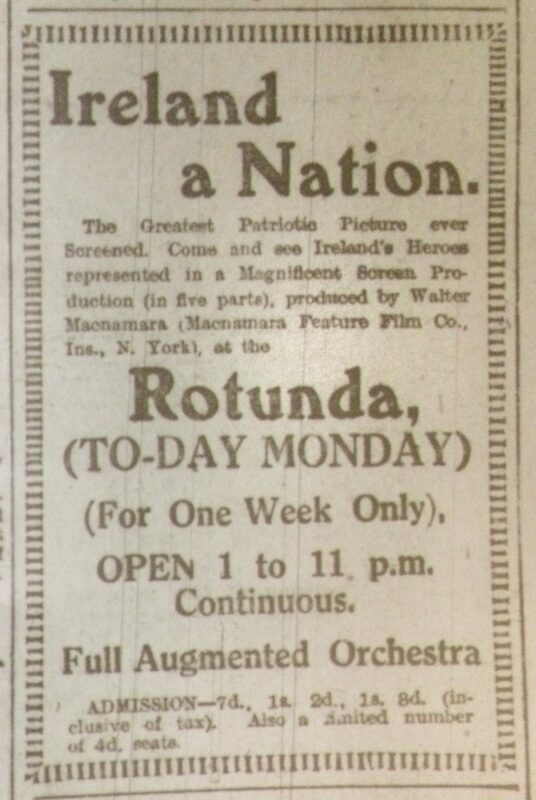 One of a series of large display ads for The Birth of a Nation in the Dublin Evening Mail, this one appeared on 16 September 1916: 2. 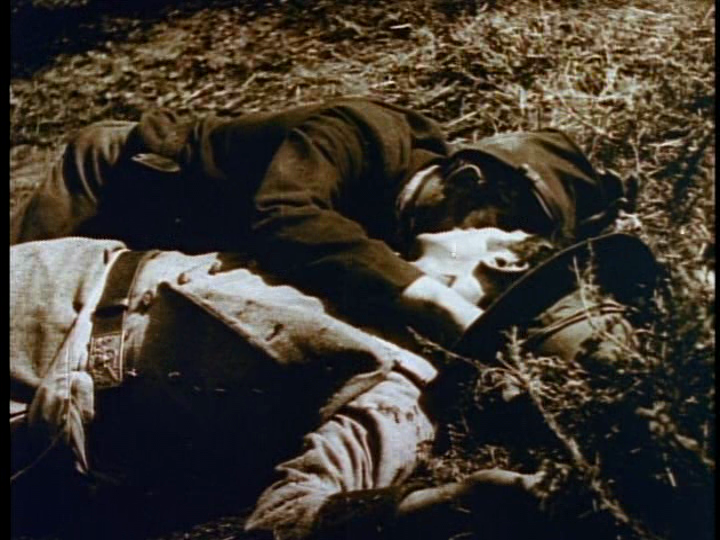 Childhood friends but belonging to opposing Union and Confederate armies, the youngest sons of the Cameron and Stoneman families meet on the battlefield and die in each other’s arms in The Birth of a Nation. The film shows us with almost overwhelming detail life in America, both North and South, just previous to and during the course of the Civil War. Mixed up with the fighting we follow the fortunes of two families united by ties of friendship but on opposite sides in the struggle. Then, when the war is over, we see the rising of the blacks, who, thanks to the slushy policy of the North, get all the power into their own hands and become bestial tyrants in consequence. Kindly before our eyes is pictured the inception of the biggest secret society the world has ever seen, for it embraced every white in the South and yet remained secret. Finally we see how this society – the Ku-Klux-Klan – by the employment of mailed glove methods and working on negroid superstition, was enabled to stamp out the black peril and permit the whites in the Southern States to live without the men carrying their lives (and their six-shooters) in their hands. 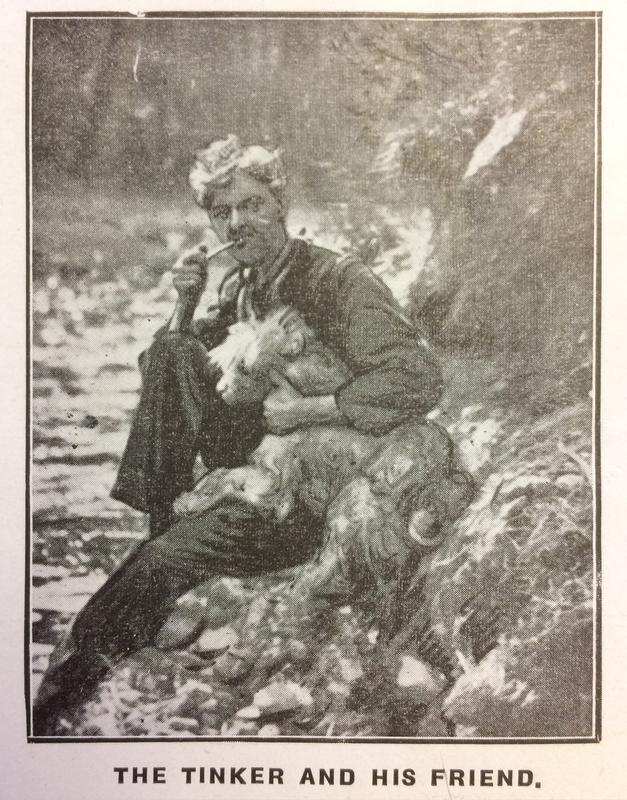 Jacques was somewhat unusual among Irish reviewers in focusing on the second, more audaciously racist part of the film, which deals with the Reconstruction, and his use of such terms as “bestial tyrants,” “negroid superstition” and “the black peril” leaves little doubt that he accepted the film’s racism. In just one climactic instance of racially imperilled femininity, Elsie Stoneman (Lillian Gish) awaits her forced marriage to the mixed race Silas Lynch (George Siegmann) in The Birth of a Nation. It gives you every emotion in the human gamut. One time you marvel at the beauty of the sunny cottonfields, then you smile at the quaint costumes. You want to kiss and cuddle the sweet young person loved by heroic young men. You feel an all-overness when you see howling mobs surging in flaming towns; you grip yourself at the sight of men amuck smashing and tearing houses above the heads of cellared women; you feel the shock of battle. You laugh and cheer and cry. It’s better than a good play. It’s a marvel. 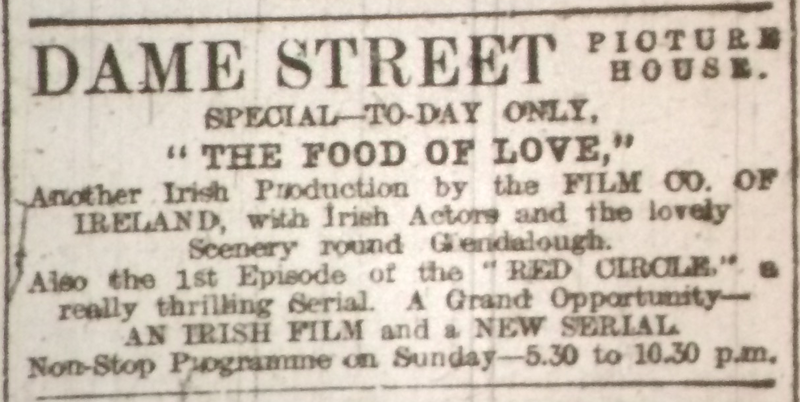 Only the reviewer at Cork’s Evening Echo in any way questioned the film’s racial politics. “The southern cotton planters were persuaded nature intended the negroes to be bought and sold and to cultivate cotton,” s/he observed, commenting that the “outlook of these planters appears peculiar at the present day,” but undermining what may be a mild criticism by adding that “one can to some extent understand it” (“Opera House”). “Mr. 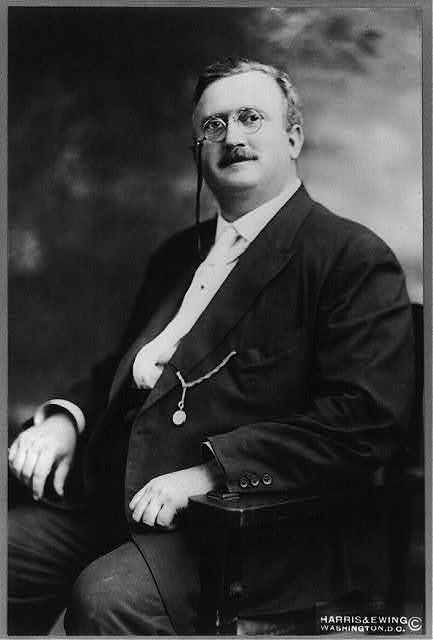 Griffith, it is easy to see, has a strong Southern bias,” the Northern Whig reviewer pointed out, “but this would not matter if it did not lead him to overstate an excellent case.” This overstatement was particularly evident in the depiction of the KKK: “to represent [the KKK] as a new order of chivalry is simply fantastic.” However, the writer’s problem appears to have been historical accuracy – the fact that it “is tinged too deeply with melodrama” – and not racist ideology: “If the Ku-Klux-Klan cannot be adorned with a halo, Mr. Griffith uses it to produce some splendid sensational thrills and the final fight for Piedmont is as good a realistic spectacle as one has ever seen staged” (“Grand Opera House” NW 8 Aug.). 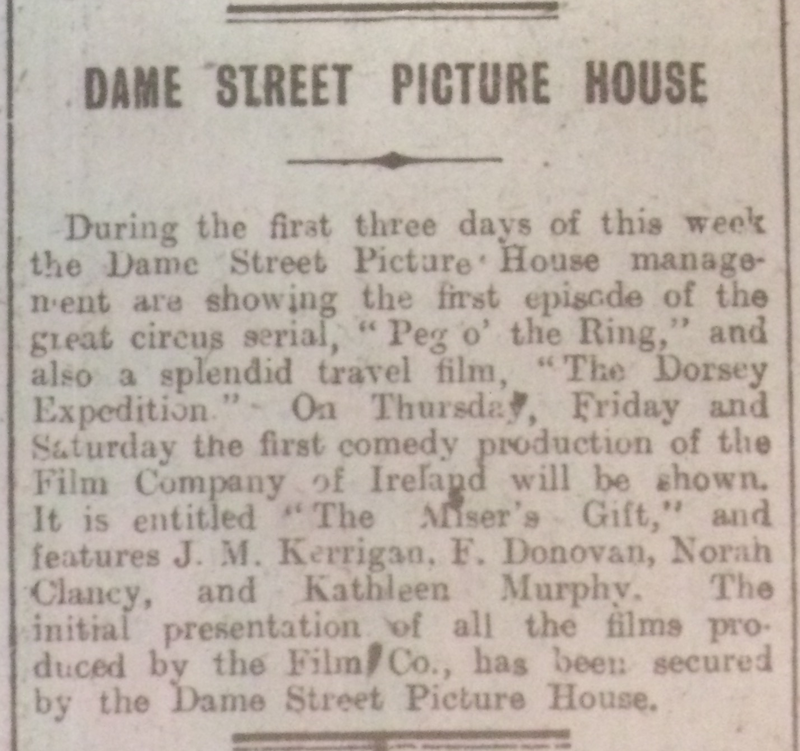 It is possible to track these difference in reception of The Birth of a Nation because it received so much newspaper coverage, and this in turn was because it played exclusively at three of Ireland’s most prestigious theatres rather than at Belfast’s, Cork’s and Dublin’s picture houses. This formed part of a deliberate international exhibition strategy designed to distinguish The Birth of a Nation as a cultural event unlike any previous film screening. 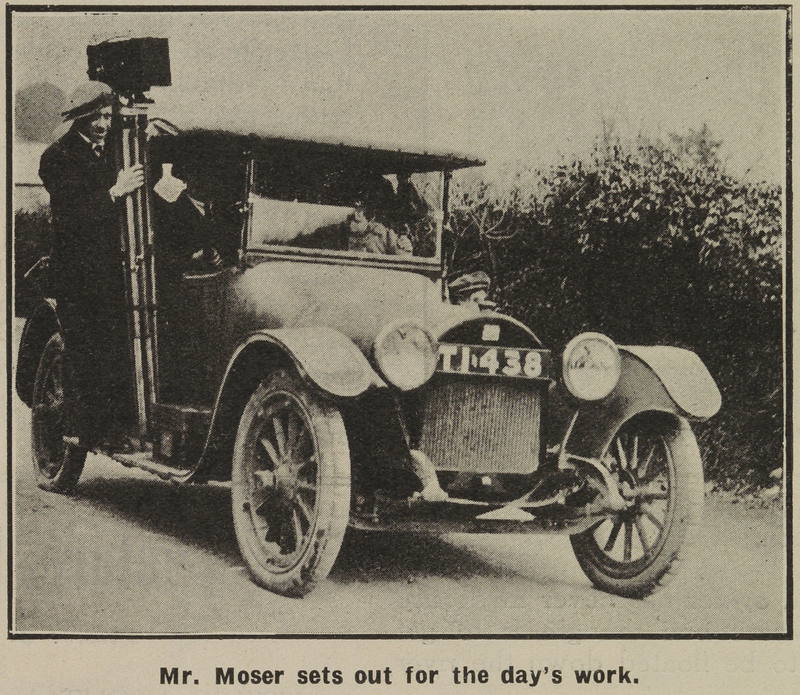 Rather than be distributed through existing distribution companies, the film was exhibited in a “road show” format, brought to the cities in which it was to be shown by a travelling company of technical crew and musicians. 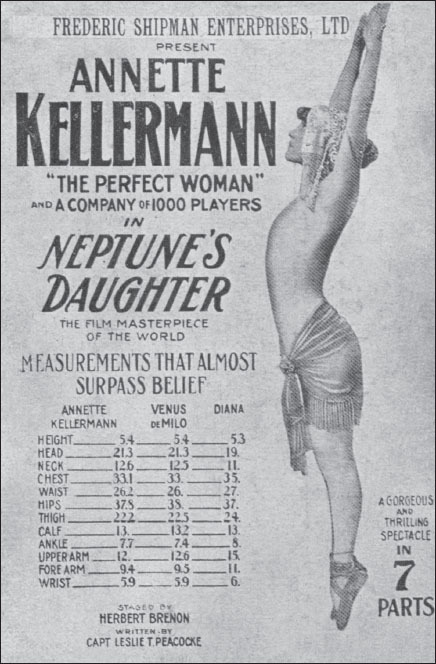 The company’s arrival was heralded by an elaborate marketing campaign that included large newspaper display ads describing – or rather exaggerating – the film’s unprecedented scale (Stokes 121). 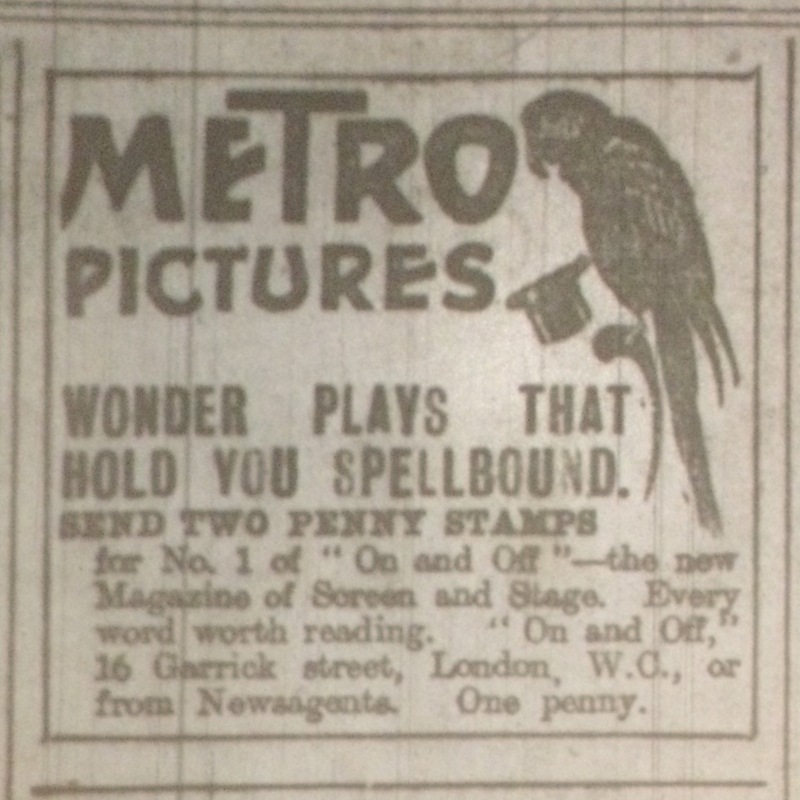 The claim repeated most often in Irish newspaper ads related less to the film’s narrative than to the assertion that the extent of the production needed to be measured in the thousands: 18,000 people, 5,000 horses and £10,000 costs. This ad quoted the overwhelmingly positive reviews in Belfast’s papers. 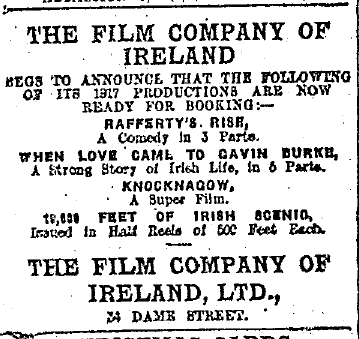 Notable missing is the nationalist daily Irish News, which did not advertise or review the film. Northern Whig 9 Aug. 1916: 7. 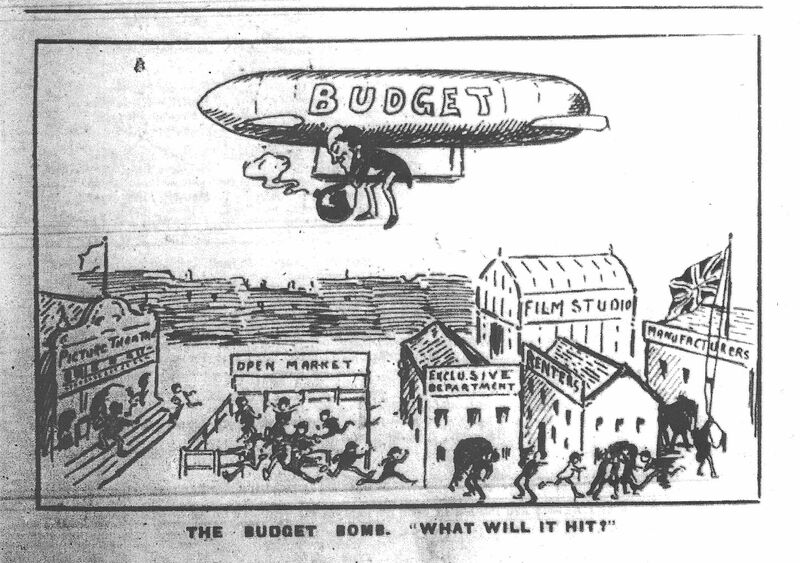 Every ad also carried a note from director D. W. Griffith guaranteeing that “‘The Birth of a Nation’ will never be presented in any but the highest-class theatres and at prices charged for the best theatrical attractions.” Theatrical prestige was financially lucrative. 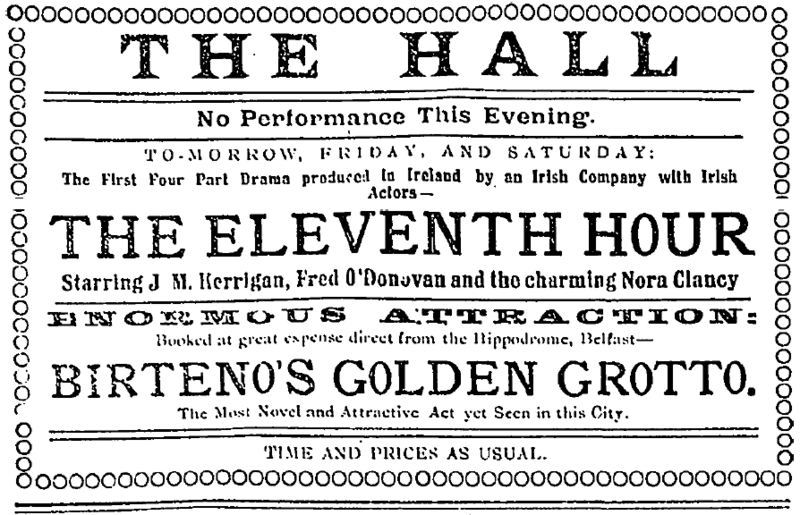 “At both houses yesterday large audiences attended,” the Irish Times’ reviewer noted in the course of a comparatively short review of the Gaiety shows, observing that luxury and expense were sometimes forced on “later comers at the evening performance [who were] unable to obtain admission, except to the dearer parts of the theatre” (“‘Birth of a Nation’” IT). 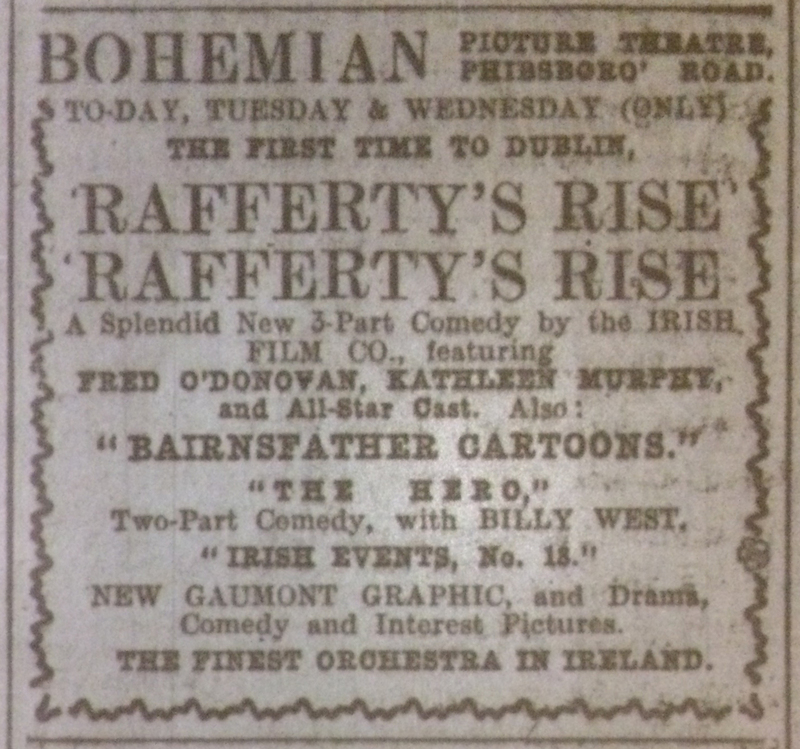 The Irish exhibition of The Birth of a Nation awaited a British road-show company that came – according to the ads – “direct from its sensational success at Drury Lane, London.” As a result, the film had taken a year and half to reach Ireland. 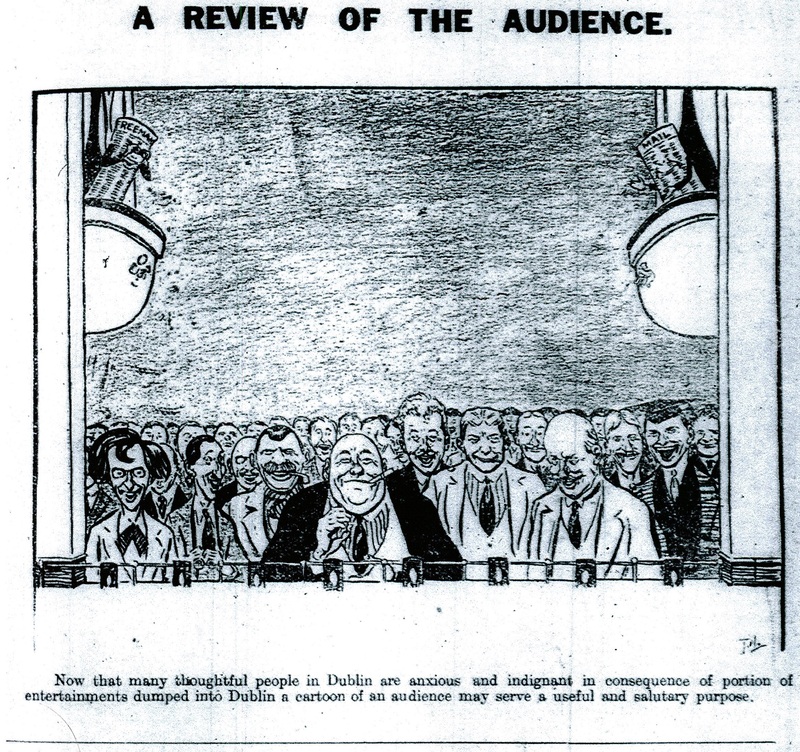 The Panopticon’s “mirth of a nation”; Belfast News-Letter 15 Aug. 1916: 1. The attempt to suggest that the prestige theatres should be the exhibition spaces for prestige films was, not surprisingly, resisted by picture-house owners. 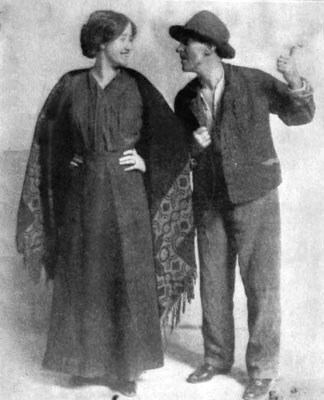 During the Belfast run, the rival Panopticon advertised that if not “the birth of a nation,” it was providing “the mirth of a nation,” albeit that its main feature Burnt Wings (Britain: Broadwest, 1916) – in which a woman adopts her husband’s illegitimate child – does not seem altogether mirthful (“Panopticon”). For distributors of other high-profile films, the choice of picture house or theatre appears to have been more pragmatic. 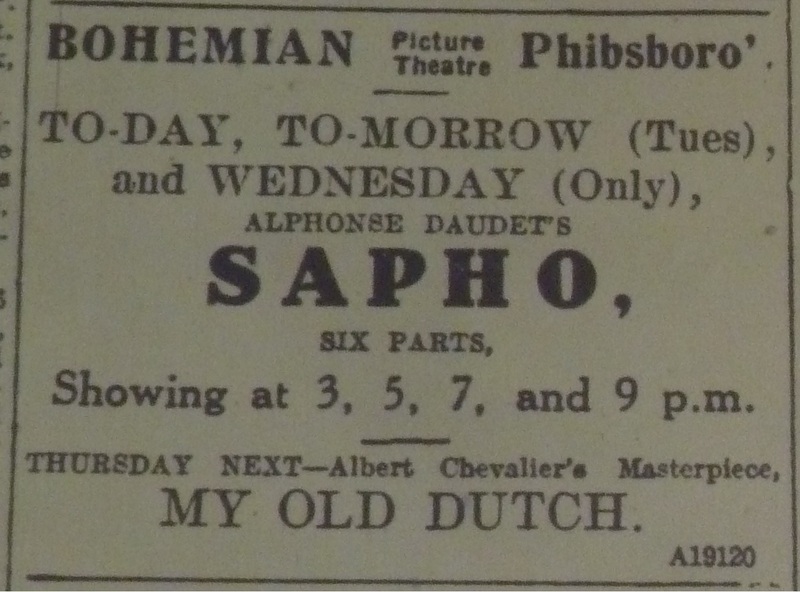 When the most ambitious of the British government’s propaganda films The Battle of the Somme finally opened on 11 September, it was first shown in Dublin at a theatre, the Theatre Royal, but in Belfast, it was shown at the luxurious Picture House, Royal Avenue. “[N]ever have the facts of war been more vividly brought home to people living far away from the scene of action,” the Belfast News-Letter commented. “For this latter feature we are indebted to the pictures which have from time to time been obtained by means of the cinematograph [… F]rom the moment of preparation, all through that deadly, but glorious, First of July, on to the crash of victory, the story is unfolded in all the strength and simplicity which such photography can give ” (“Battle of the Somme”). 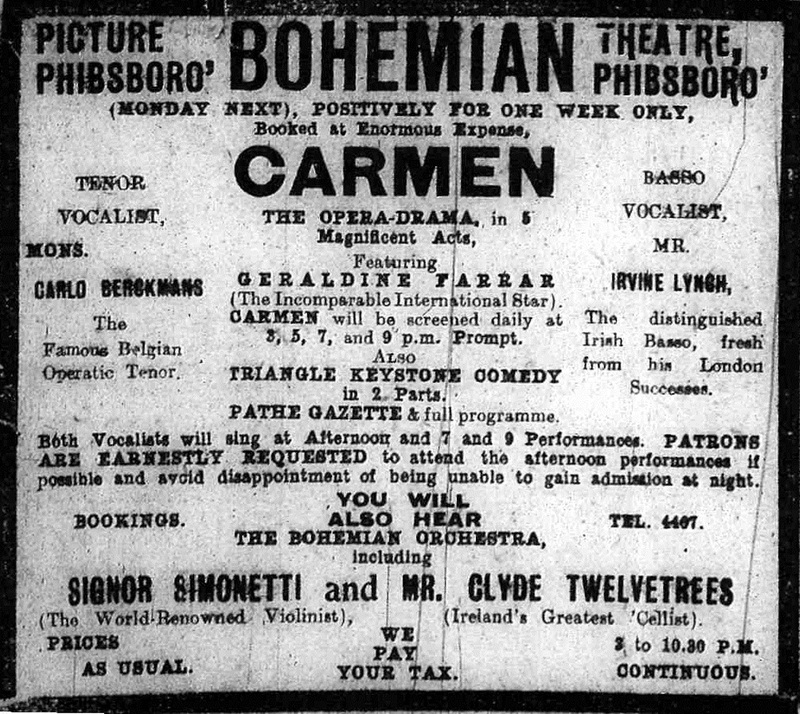 Carmen, a silent-screen opera; Dublin Evening Mail, 26 Aug. 1916: 2. 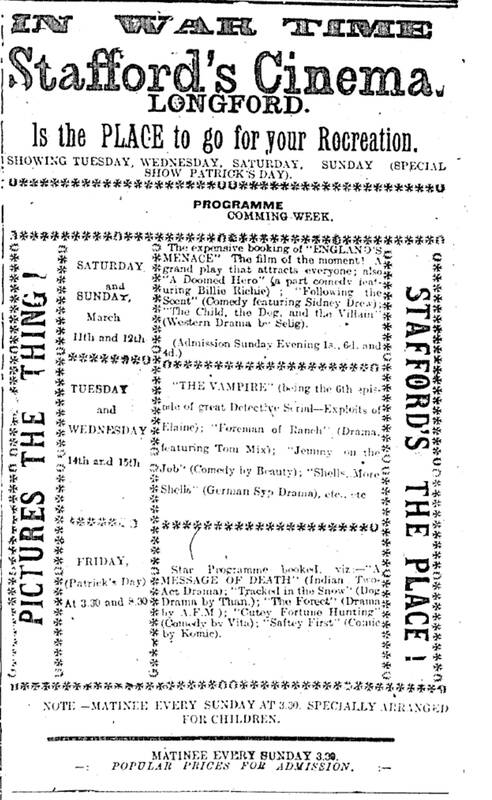 Undoubtedly, certain picture houses were capable of mounting productions that rivalled the theatres’ biggest spectacles. 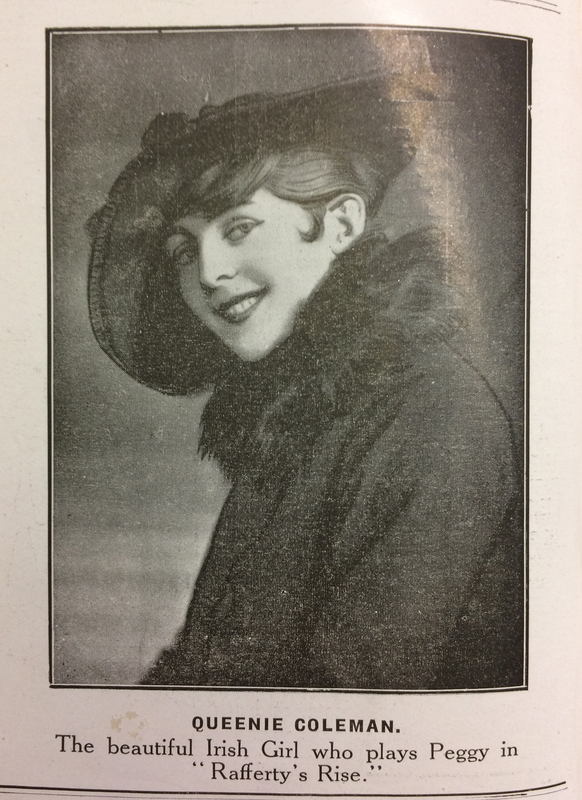 In the week beginning 28 August, Dublin’s Bohemian capitalized on its acknowledged superiority in musical attractions by exhibiting the opera film Carmen (US: Lasky, 1915), directed by Cecil B. DeMille and starring Metropolitan Opera diva Geraldine Farrar in her first film role. 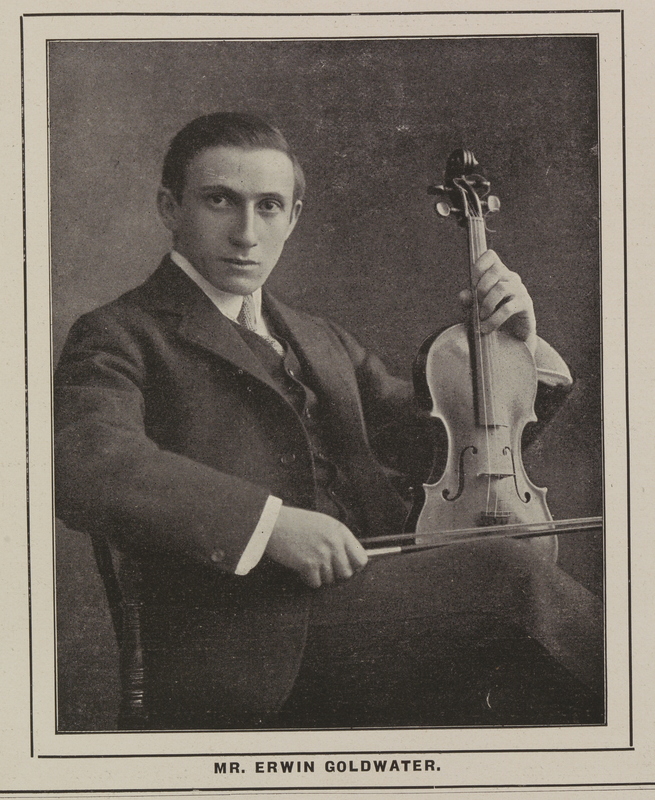 Farrar did not, of course, appear at the Bohemian to sing her part, but the live musical accompaniment by the Bohemian orchestra was supplemented by both concert instrumentalists Achille Simonetti and Clyde Twelvetrees and vocalists Belgian tenor Carlo Berckmans and Irish basso Irvine Lynch. 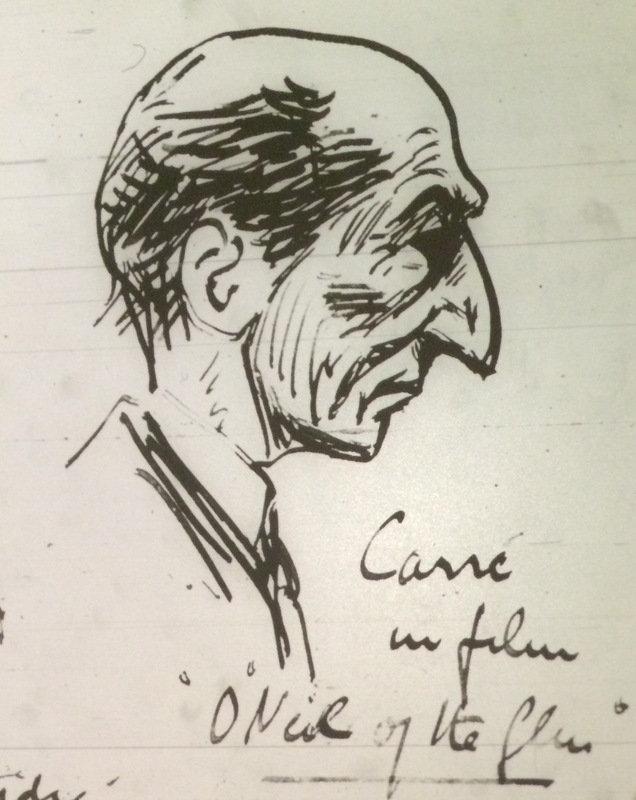 Joseph Holloway saw several films apart from The Birth of a Nation in September 1916, including a second viewing of the Film Company of Ireland’s O’Neil of the Glen, at which he sketched actor J. M. Carre. Lincoln refuses to deal harshly with the Southern Leaders, & says, “he’ll treat them as if nothing occurred at all!” – on a shout coming from one of the audience “where is Sir John Maxwell to hear that?” followed by great approval & the contrary, till she got quite frightened of there being a row. 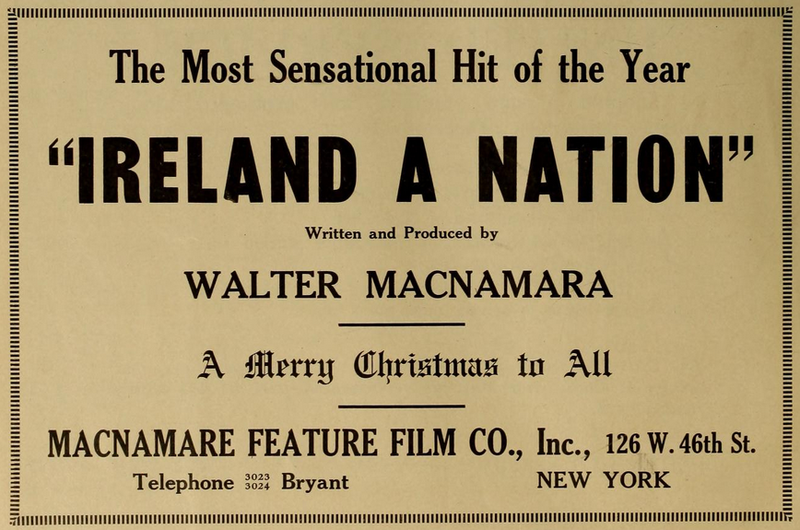 For Miller, the memories and local references the film evoked related to nationalist politics, in this case, the Easter Rising. 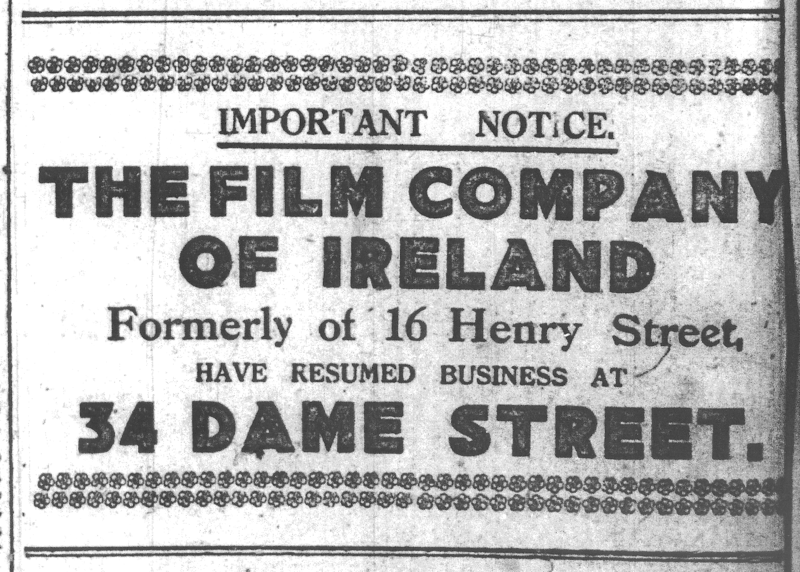 This film ad openly praised the Ku Klux Klan; Belfast News-Letter 3 Aug. 1916: 7. The Belfast context was quite different. 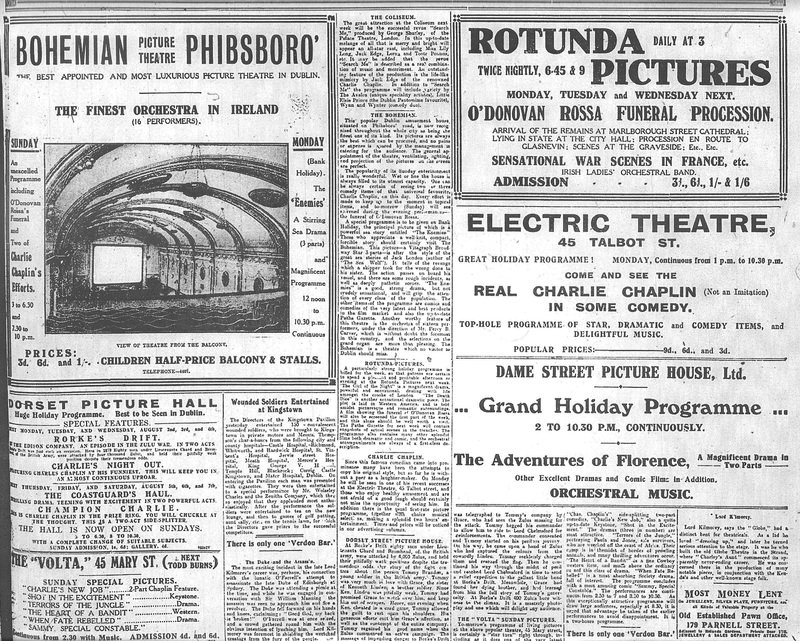 As no equivalent of Holloway’s diary exists for Belfast and as the Irish News – the city’s main nationalist newspaper – did not advertise or review the Grand Opera House shows, the surviving responses to The Birth of a Nation come from the city’s unionist newspapers. 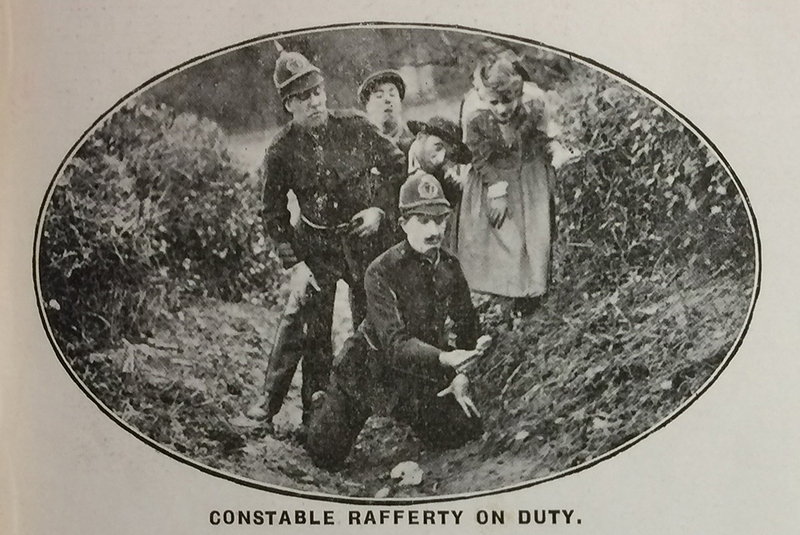 As well as this, the film opened on 7 August, more than a month earlier than in Dublin, putting it in the high summer, when an exodus from the city to seaside resorts was being reported (“Holiday Scenes in Belfast”). 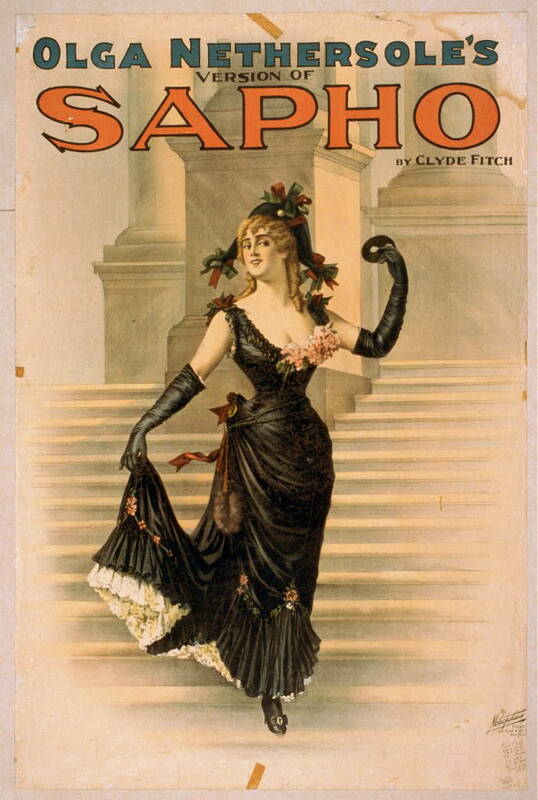 “Even in such hot weather as we have been experiencing recently a visit to the Opera House to see the ‘Birth of a Nation’ will not be regretted, but on the other hand will long be remembered with much pleasure by all who pay it” (“Birth of a Nation” NW). 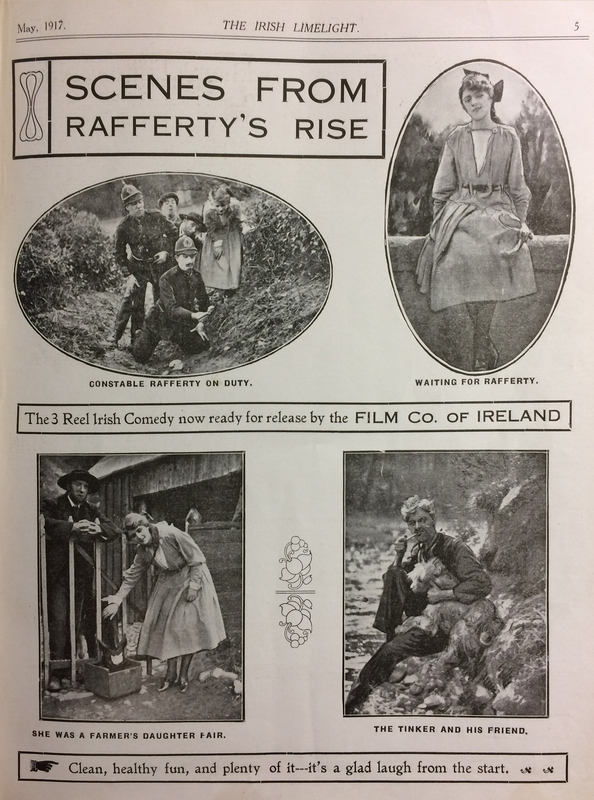 Despite this, the film ran for three weeks, a week longer than in Dublin, and the papers reported that the enthusiasm of Belfast audiences had not waned even by its third week, “which finds the film in higher favour than ever. 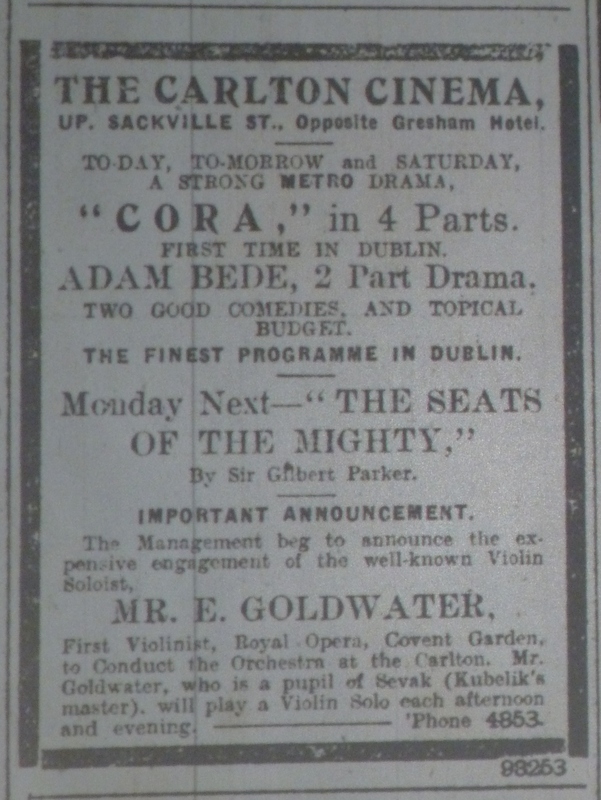 […] Not only is Mr. Griffith’s spectacle continually drawing new admirers but a great many people are discovering that it well repays a second and even a third visit” (“Grand Opera House” NW 22 Aug.). For the reviewers in Belfast, the outstanding feature of local relevance in The Birth of Nation was its depiction of war, which made it particularly timely given that the papers were elsewhere reporting on the battles of the Somme and Verdun and at one point, on the increased use of non-white soldiers in battle (“Coloured Men and the War”). “The battle of Petersburg, in which the Federal troops sustained their greatest and final defeat, caused great interest on account of the close analogy it bears to the fighting on the Western front to-day,” the Belfast News-Letter observed, “it was one of the earliest, if not the first occasions in history, on which the contending armies entrenched in the open with the opposing lines only a few yards apart” (“Grand Opera House” BN). However, the film’s contemporary relevance came not just for these battlefield details but also from the depiction of the emotions felt by soldiers’ families. 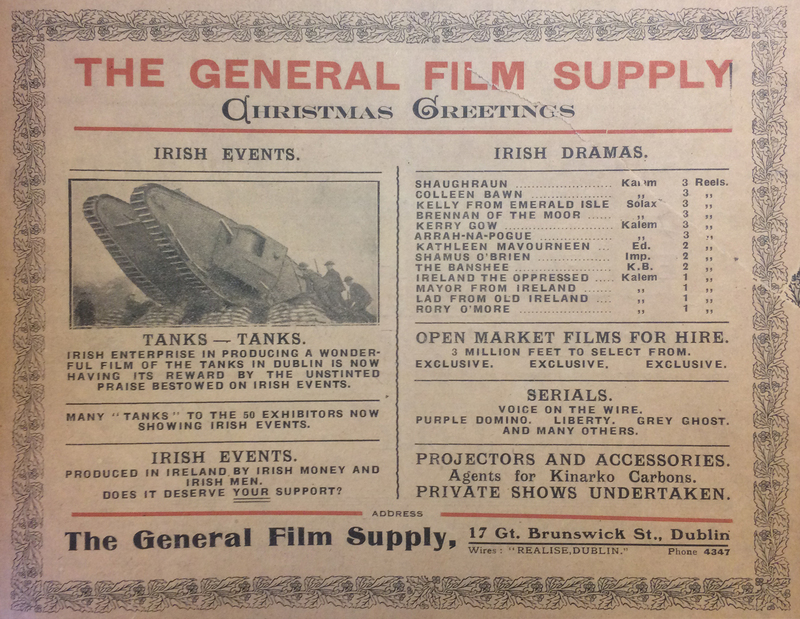 Although a greater emphasis fell on the war scenes in Belfast – “where picture houses thrive and claim thousands of habitués” – it was also true of Dublin and Cork that “[t]he prophesy that the film would create a sensation wherever it was produced has been fulfilled to the letter” (“Grand Opera House” NW 15 Aug.). 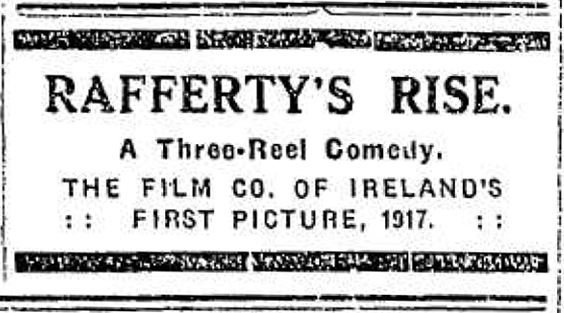 Irish filmgoers – but not cinemagoers – thronged to see Griffith’s massive spectacle in the autumn of 1916, were duly impressed by it and had few qualms about its racism. “The Battle of the Somme: Historic Film to be Exhibited in Belfast.” Belfast News-Letter 18 Aug. 1916: 8. 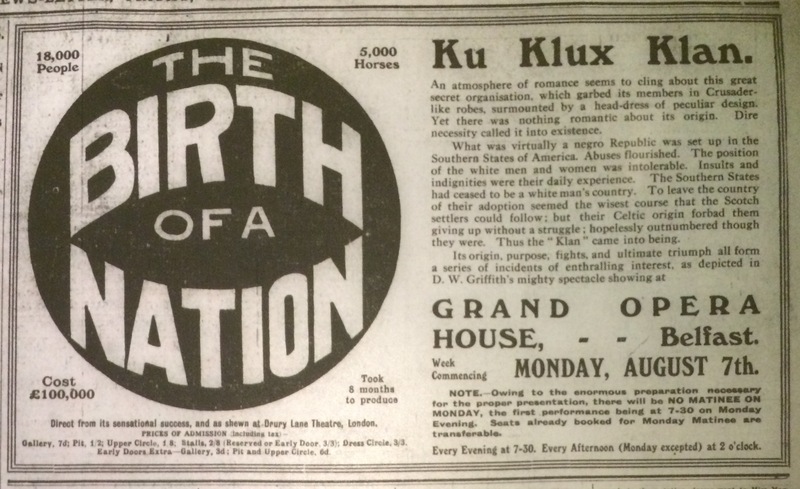 “The Birth of a Nation.” Northern Whig 12 Aug. 1916: 6. 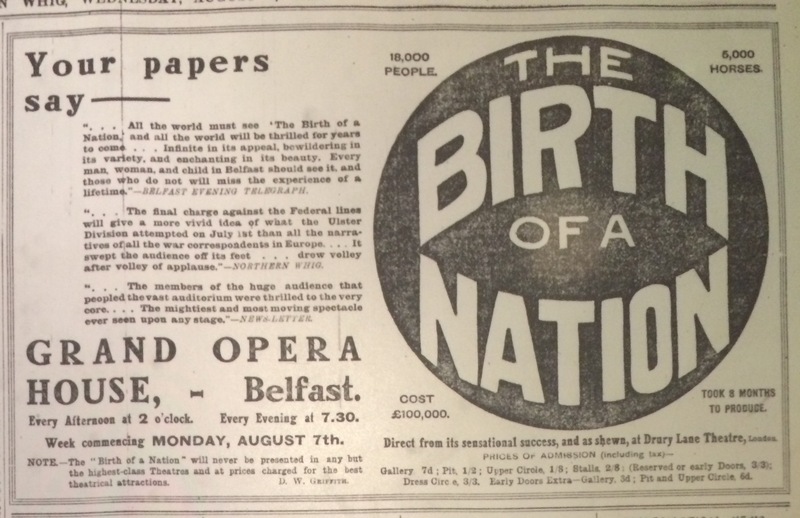 “‘The Birth of a Nation’: Impressive Spectacle at the Grand Opera House.” Belfast News-Letter 12 Aug. 1916: 2. 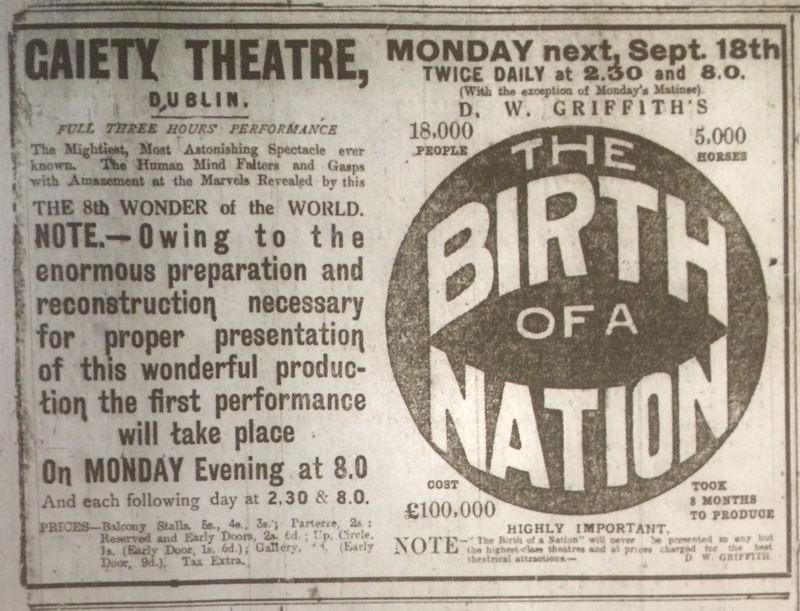 “‘The Birth of a Nation.’” Irish Times 20 Sep. 1916: 3. “Coloured Men and the War.” Belfast News-Letter 4 Aug. 1916: 8. 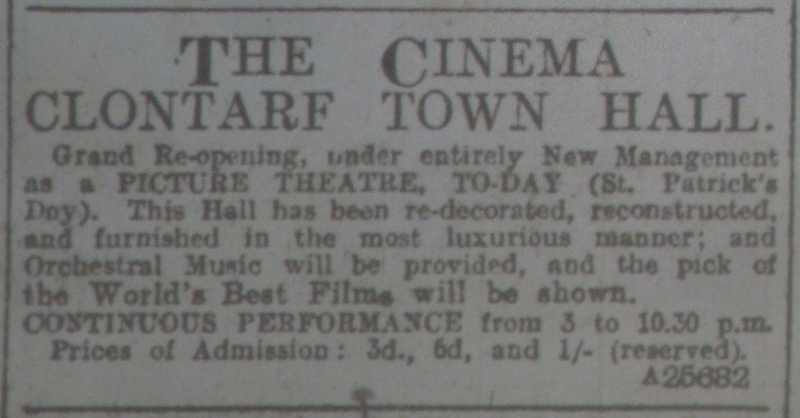 “Grand Opera House: ‘The Birth of a Nation.’” Belfast News-Letter 8 Aug. 1916: 2. “Grand Opera House: ‘The Birth of a Nation.’” Northern Whig 8 Aug. 1916: 7; 15 Aug. 1916: 7; 22 Aug. 1916: 7. Holiday Scenes in Belfast: Big Exodus to the Seaside: The Railway Stations Besieged.” Belfast News-Letter 8 Aug. 1916: 4. Hughes, Tom. How Belfast Saw the Light: A Cinematic History. Belfast: Hughes, 2014. Pp. 237-40. Jacques. 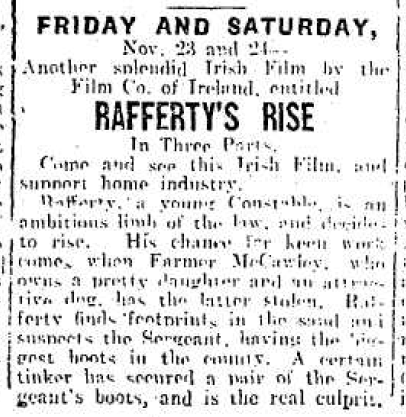 “Absolutely It: Amazing Realism at Gaiety Theatre: ‘Birth of a Nation.’” Evening Herald 19 Sep. 1916: 3. The Man About Town. 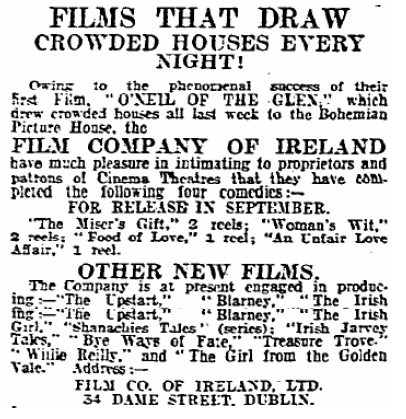 “Things Seen and Heard.” Evening Herald 26 Sep. 1916: 2. Miller, Nicholas Andrew. 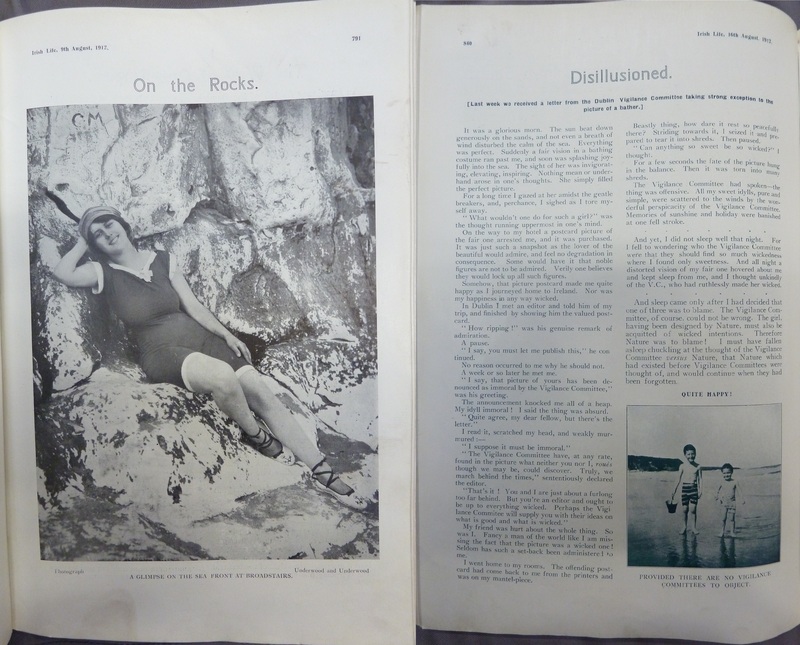 Modernism, Ireland and the Erotics of Memory. Cambridge: Cambridge UP, 2002). 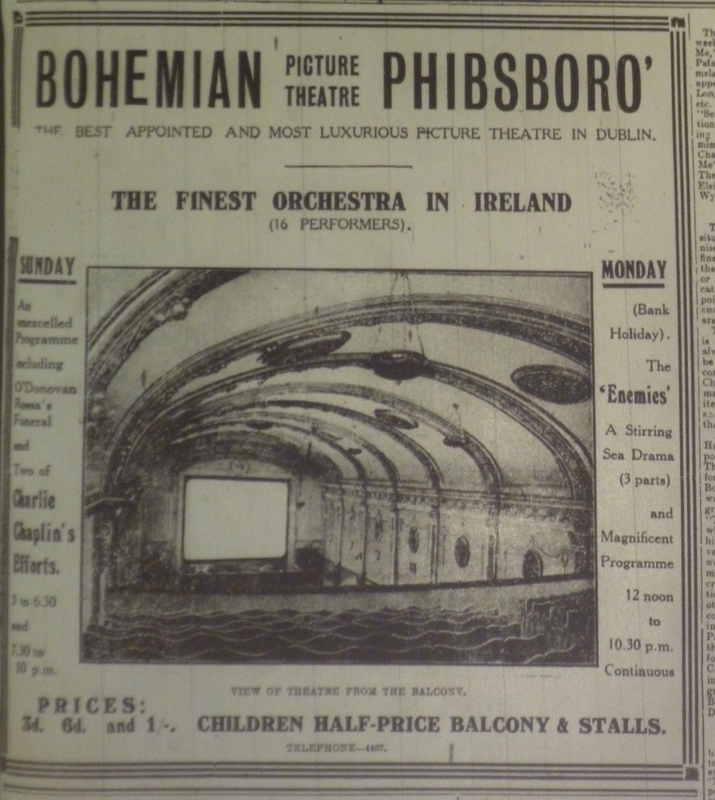 “Opera House: ‘The Birth of a Nation.’” Evening Echo 29 Aug. 1916: 2. “Panopticon.” Belfast News-Letter 15 Aug. 1916: 2. Stokes, Melvyn. D.W. Griffith’s The Birth of a Nation: A History of “the Most Controversial Motion Picture of All Time.” New York: Oxford UP, 2008.